The style guide: which glasses suit me? If you are shopping for a new pair of glasses and find yourself asking the question "but which pair of glasses really suits me? ", there are a few things to take into account. In addition to some basic principles regarding the shape of the face and the size of the glasses, your personal taste and the purpose (reading, sport, driving, etc.) 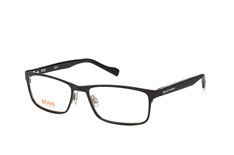 are important factors when selecting new glasses. The best starting point is your current pair of glasses. 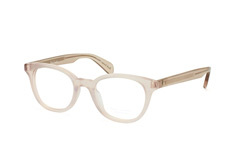 If, in general, you like the way they look, you can simply opt for a similar frame shape. However, if you want to try something new or you are buying your first pair of glasses, we have put together a list of some basic hints and tips to make it easier for you to find that perfect pair. 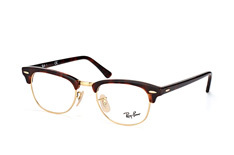 Is there a glasses frame shape that will flatter my face shape? This is the most important question when in the market for a new pair of specs, and although each face is unique, there are some basic guidelines when choosing glasses. In addition to personal taste, the facial shape often determines whether a pair of glasses will harmonise with your face. Tip: try eyewear online with a 2-D or 3-D fitting. This way you can get a good impression right in front of your screen. You can start a virtual test of the glasses by uploading a photo or using the webcam. Read on as we explain common face shapes and give you recommendations on frames that will look fantastic. 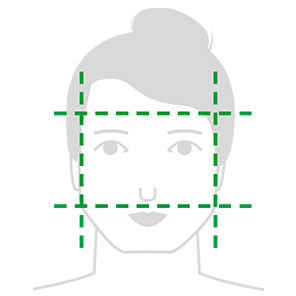 Since the forehead, cheeks and chin are all equally broad and the jaw tends to be rather pronounced, square faces are often distinctive and angular. 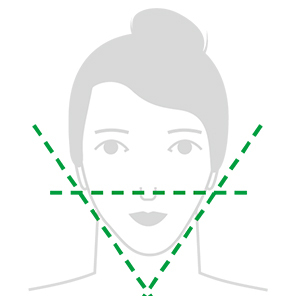 Those with this facial shape look great in oval or round glasses, since these soften the angular features. Aviator glasses or models in cat-eye style are flattering on an angular face. 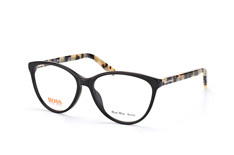 Glasses with square frames, on the other hand, emphasise angular faces and are therefore not really recommended unless you are intentionally going for a rather severe-looking style. 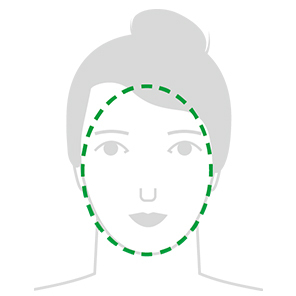 In round faces, all features are uniformly shaped. The cheeks and forehead are about the same width, the chin is round and the face has a soft look to it. 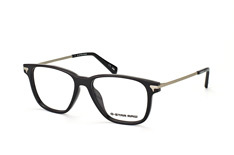 Rectangular glasses shapes give round faces some contour, lengthen optically and make the face look narrower. Frames should be elegant but not too thin. 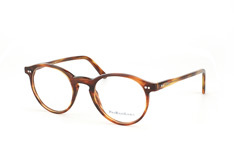 Avoid round or oval glasses as they will only make the face look rounder. The typical features of the heart-shaped face are a broad forehead, pronounced cheekbones and a narrow, tapering chin. Just about every frame looks good on this face shape. 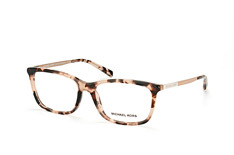 Angled spectacle shapes that are wider towards the top bring a bit of a contour into the face. Above all, oval and round glasses flatter heart-shaped faces and bring them visually into balance. 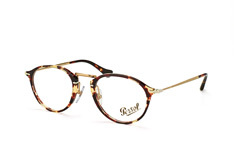 Delicate frames ensure softer contours and a more harmonious appearance. Bright colours and wide frames are rather unfavourable as they underline the heart shape. The proportions of oval faces are usually balanced and harmonious. While chin and forehead are rather narrow, the cheeks are more pronounced. The oval face is about twice as long as it is wide. People with this facial shape have it easy to find the perfect pair of glasses. They can wear any style, be it round, angular or bold. It is only necessary to ensure that the glasses are not too big or too small. However, it is best to avoid very narrow frames, as they lengthen the face visually and make it look longer. Is your face rather narrow, medium-sized or wide? This is the starting point for the next step. 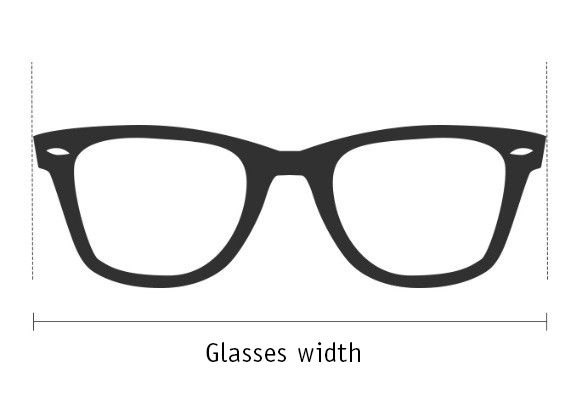 If you already have a pair of glasses, you can simply measure your glasses from cheek to cheek to determine the width. 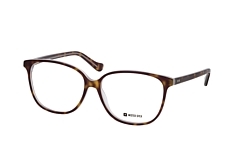 Tip: Mister Spex has developed a search function to help you find glasses in the same or a similar width. You can find the search function directly under the width filter on the overview page of our glasses and sunglasses. You will also find detailed instructions on our service page on the topic of choosing the size for your glasses. First and foremost, the size refers to the width of the frame. If it is too large or too small, it can quickly slip or create pressure points. 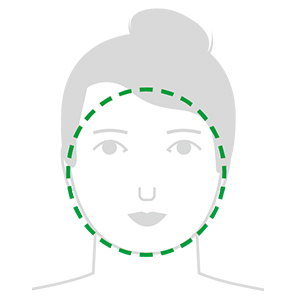 For the perfect fit, you simply orientate yourself to the width of your face and let your hair fall naturally. Of course, if you are going for a certain look, you can ignore this rule. Fashionable cat-eye or butterfly glasses, for example, are somewhat larger in size, while nickel glasses are smaller. The bridge width is the shortest distance between the lenses below the nose bridge and is measured from the inner edge groove of one eye to the inner edge groove of the other. Why is this little piece so important? 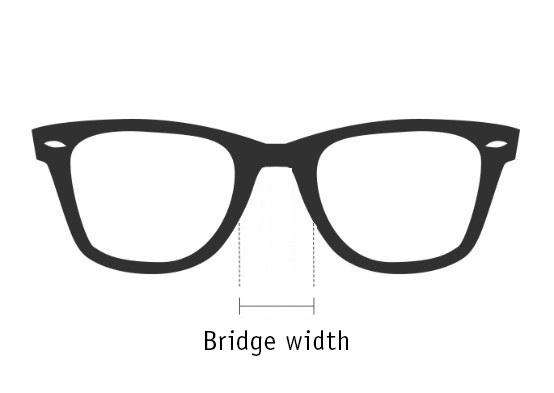 In order for the glasses to fit well, the bridge of the glasses must fit the width of your nose. If the glasses do not sit properly on the nose, this can lead to unpleasant side effects like pressure points or headaches. The optimum visual performance also suffers because, if the glasses slip, the optical centre also slips. This is about your field of vision. With small lenses, your field of vision is somewhat restricted whereas with a larger lenses, your eye also captures external viewing zones. However, the glass should not be wider than your face and the eyebrows should remain visible. An exception here is with sunglasses: the eyebrows often deliberately concealed for optimal sun protection. The lenses are measured at the widest and highest points and the point in the middle is ideally where you should be looking through. 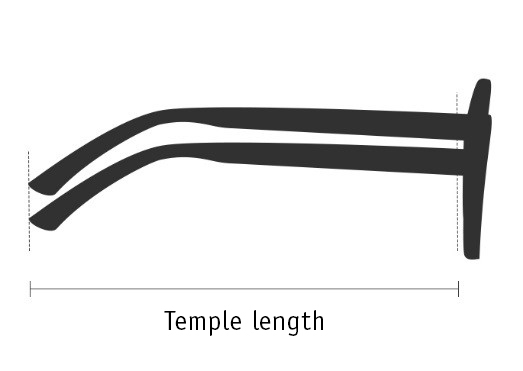 The length of the temples determines the wearing comfort of your glasses, as they must sit properly. If they have too much room, the glasses have no hold and if they are short, the glasses sit too rigidly, resulting in pressure points and headaches. An optician can adjust the temples to fit you. 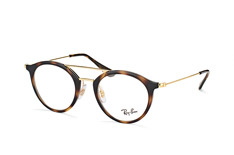 Tip: you can order up to four pairs of frames to be delivered to your house at no cost. Try them on for up to 10 days before returning. Find out more here. How much are your correction values? For both shortsighted (myopic) and longsighted (hyperopia) prescriptions, the higher the values, the thicker the glasses. 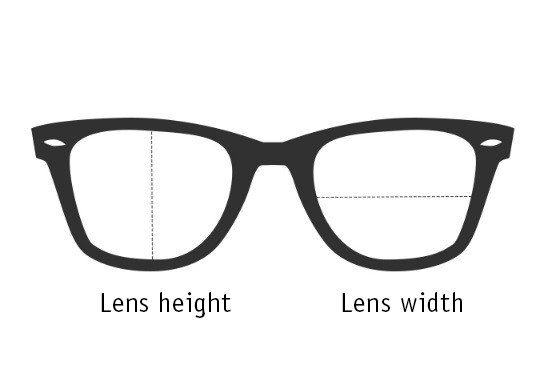 For this reason, if your values are really high, you will need a thick frame to contain the thick lenses. 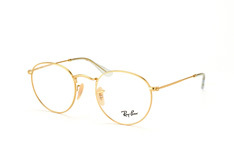 If your values are low, you can choose delicate frames. If you only have eyesight problems when reading texts or, for example recognising the keyboard at work then reading glasses could be just what you need. Do you need a varifocal lenses in your everyday life? If so, you must select frames with a predetermined minimum height. If you have found your perfect glasses and you know your prescription, you can order the glasses right away! If you do not know your prescription or if your glasses are not sitting properly, you should go to your optician for an eye test or an adjustment of your glasses.